Well, I finished this at about the same time as finishing my Master's thesis, and I don't know which one I'm more proud and excited about. It actually spins, which is amazing to me because halfway through this process it was just going blup....blup... in a lopsided manner, and I picked up one of my Ladakhi spindles and just marveled at the speed and smoothness of the spin. I have a new appreciation for hand-carved spindles that spin well. 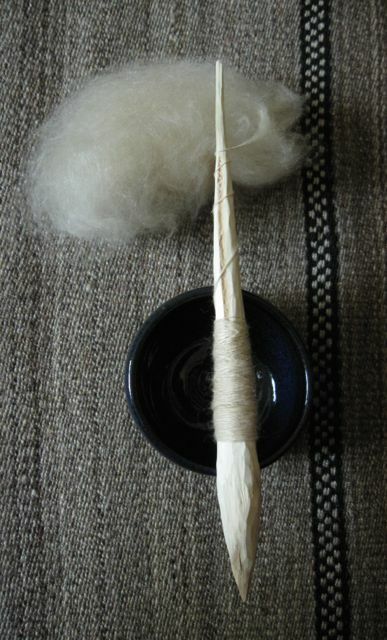 But as I said, this one does spin, and the yarn I'm making with it proves its success as a tool. It's definitely not the most beautiful spindle, and mistakes were made, but for the first time I've turned a stick into a spindle with my pocket knife, and that speaks of promise! The pith is showing in the photos, and it's on the side like that because this stick was slightly curved. I wasn't sure if I'd be able to get a straight, balanced spindle out of it, but my whittling mentor David Gowman said it was possible: I just needed to 'find the straight line.' This is why it was lopsided for a long time - I was reluctant to remove too much of the bulge, because I like phang-shaped spindles that have wide, substantial swells to them. But on the bulky side, more had to come off to allow for the spin. This one wee project taught me so much, and I see my Ladakhi spindles and those made by my friend Janet completely differently now. I'm wishing for more willow sticks.